Is it a buttercup, butternut or acorn? Finding your way around squash is not always easy, especially when one species can sometimes have more than a hundred varieties and a single fruit can often be known by different names in different places. Having said that, any type of squash can be easily replaced by another in most recipes. As for the pumpkin, it also marks its presence in our autumn meals, although it is most often used as a simple Halloween decoration. 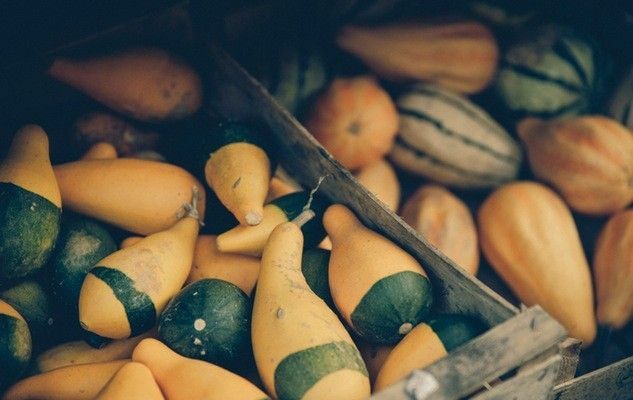 All the species of squash originated in America, where they have been natively grown for almost 10,000 years. They contain numerous nutrients such as fibers, potassium, vitamin C and vitamin A. The more orange the colour of their flesh, the richer they are in vitamin A. Pumpkin seeds, which are rich in zinc, iron and magnesium, are also very nutritional. Choose squashes that are intact, firm and dense with a dull skin, all signs that they have been picked upon attaining full maturity. You can preserve them for many weeks or even months, if you keep them away from cold, heat and light. They freeze well, either cooked, diced or in puréed. To cook a squash, cut it in half, make holes on it with a fork and put it into the oven at 175°C/350°F for 45 to 60 minutes, depending on its size. Originally published in the Journal de Montréal on October 18, 2008.